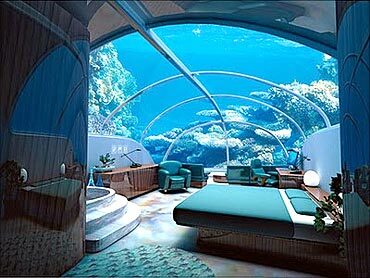 Rediff.com » Business » Check out these amazing undersea structures! Check out these amazing undersea structures! 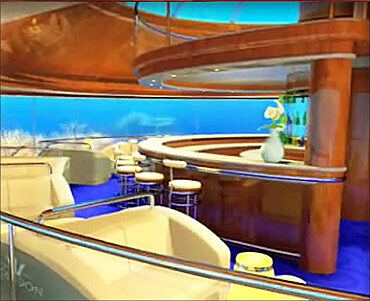 Poseidon Undersea Resort is the world's first seafloor resort at Fiji island. Located 40 feet under the water in a luxurious ambience, this resort offers a unforgetable experience. 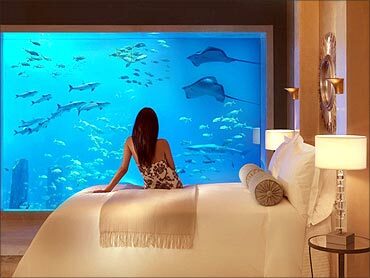 The Poseidon Undersea Resort charges $30,000 per couple, which includes transport from the Fiji airport, four nights in a luxury beachfront or over water villa, two nights in a luxury underwater suite, diving onboard a luxury liner submarine, scuba diving, snorkeling, gourmet meals and drinks and other activities. 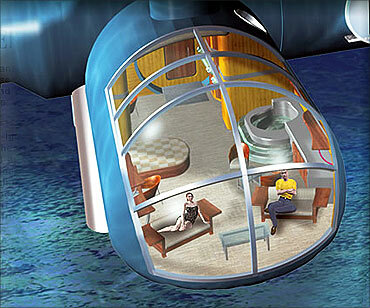 An elevator takes guests under the sea to 24 amazing suites. 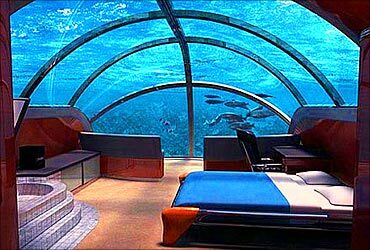 There are three types of luxurious accommodation here: one above the ground with a private beach, one over the water and one below the ocean's surface, on the sea floor. The suites offer a sitting room with a library, personal office amenities, high speed internet access, wi-fi connection and multi-line telephones. Image: Spacious rooms with a view. 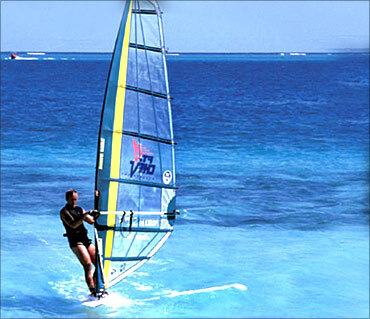 The resort has six restaurants and seven bars offering splendid views of the sea. 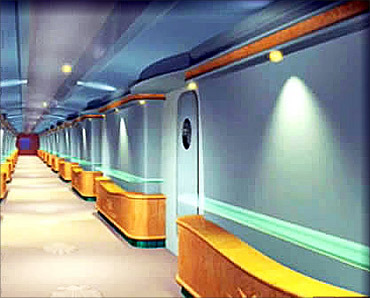 Guests can use a submarine or a special tunnel from the beach to get into the resort's restaurant, bar or spa. For the adventurous, there are activities like diving, manoeuvring a submarine through the tropical lagoon. 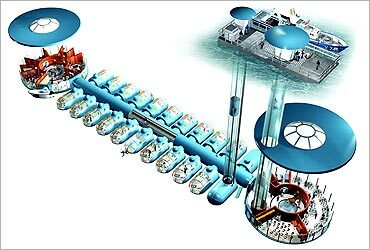 You can explore the ocean on a 16-passenger luxury submersible. Image: Tourists at the resort. T he resort has a retail boutique. It also offers a theatre, conference area and a wedding chapel. 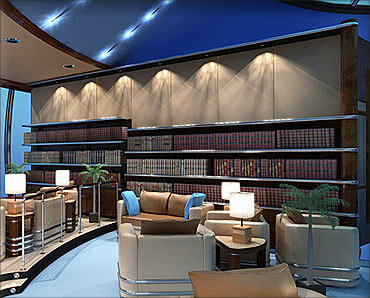 Fitness amenities include a nine-hole golf course, tennis courts, swimming pool and health club. 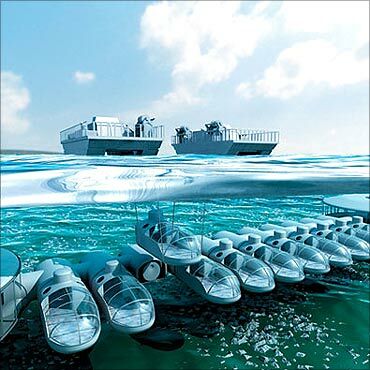 The suites are designed as detachable modules that can be kept under water. Refrigerators in the rooms are stocked with snacks, champagnes and wines. Image: Transparent rooms offer a great view. The idea of building Poseidon was conceived and developed by L Bruce Jones, president of US Submarines, Inc financed by TOPA equities Corporation owned by John Edward Anderson. Anderson said the idea came from his wife. The resort was a gift to one of his grand-daughters -- Maria Samantha Khayle Saskiah Anderson -- on her 16th birthday as she always dreamt of being a mermaid. 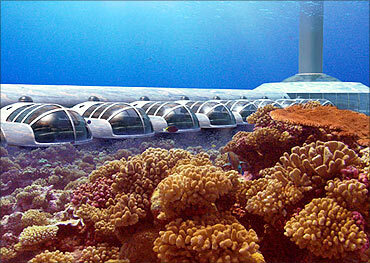 The resort is built by US Submarines, world's top manufactures of submersibles by using techniques used to build advanced submarines, making it structurally safe. Image: A guest from the resort. A Dutch firm is building a $500 million floating golf course in the Maldives. 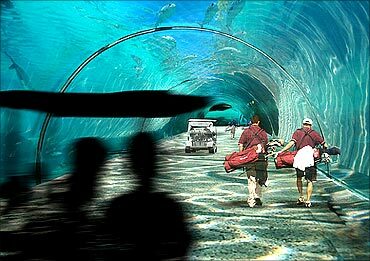 Powered by solar energy, the golf course will be connected by underwater tunnels. 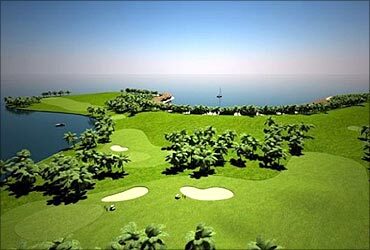 The floating golf island will be connected to a series of hotels with underwater tunnels, which will overlook the golf course. 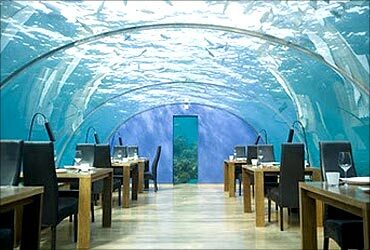 Click NEXT to see a stunning undersea restaurant . . . 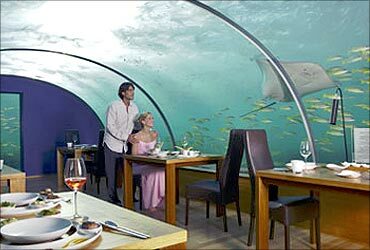 This unique undersea restaurant is located in the Conrad Maldives Rangali Island. With spectacular views of marine life, you can enjoy Maldivian cuisine here. 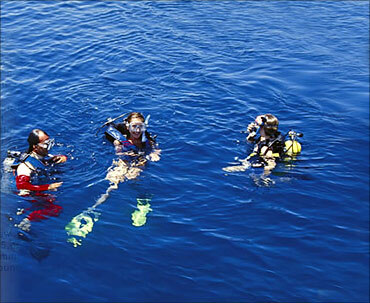 Set five metres below the surface, Ithaa offers panoramic underwater views. Inside the amazing Airbus A380: Don't miss it! Amazing attractions in malls: Snow, sharks...more!